As if shrewdly timed to calm our nerves after the big bang that was Avengers: Infinity War, Marvel’s latest offering Ant-Man and The Wasp is a breezy, lighthearted, and relatively low-stakes adventure. It’s not as if the characters in this film don’t flirt with danger, or that there aren’t any bad guys trying to do them in – there are. But nobody’s trying to end the world, nobody’s wiping out entire cities…and boy is that a relief! I’m going with three-and-a-half out of five for Ant-Man and the Wasp. It’s a consistently enjoyable film that’s more surefooted than its predecessor, and while it’s never groundbreaking, you will break into plenty laughs. Directed by Peyton Reed from a script by Rudd and a raft of co-writers, Ant-Man And The Wasp serves its purpose with a characteristically sunny disposition and occasional flair, situating its various heroes, villains and sidekicks for future installments and moving the Marvel behemoth ever forward. Amid a story that seemingly will never end, Rudd brings warmth and modest good humor to one of its most ingratiating and sweet-natured chapters.Ant-Man And The Wasp is merry and fleet, and no less enjoyable for being instantly forgettable. The buzz might be temporary, but it’s fun while it lasts. Rudd steals the show once again; he has never been funnier. The best moment in the film is Lang channeling a strange woman typing an algorithm on a screen and it is done so effortlessly well you wish for access to the improv outtakes. It is all set up really nicely leading up to the next Avengers film and even though it is not tough to guess how Ant Man is going to face Thanos and beat him, the wait for the inevitable moment until next year is going to be painful. MCU! Just how do they do it? Despite hordes of Marvel films being unleashed on the audience at regular intervals, superhero exhaustion is nowhere in sight. Set after ‘Captain America: Civil War’ and leading up to the events of ”Avengers: Infinity War’,’the Ant-man sequel is a thrilling fun ride that engages you emotionally and amuses you with its CGI antics and comic demeanour. 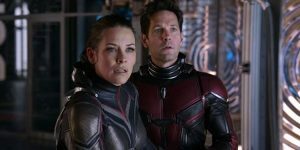 Overall, ‘Ant-Man’ and the Wasp is the Marvel underdog that scores big, replicating the nature of the ongoing Football World Cup. It also explains why Lang didn’t join the Avengers in Infinity War. Watch it! PS: Do wait for the mid and post credits scenes! Although the plot is somewhat labored, returning director Peyton Reed keeps the pace breezy, and the script packs in loads of laughs and thrills. The effects, particularly in IMAX 3D, are truly special. A throwback to Marvel’s jaunty Guardians of the Galaxy double bill (2014 and 2017), Ant-Man and the Wasp is a buzz-worthy blockbuster. As with most Marvel films, there are a couple of post-credits codas, so don’t hurry out of the multiplex.